Designed specifically for first-year study skills courses, Your College Experience, Study Skills Edition, teaches students the essentials of academic success through ample in-text exercises. The newest edition to the best-selling first-year franchise by John N. Gardner and Betsy O. Barefoot, this text is designed to help students both engage in the course material and to apply the skills learned to their other academic courses. This text will help students with managing time preparing for class, developing critical textbook reading strategies, improving note taking, and preparing for and taking tests. Look to this affordable text to guide students through the first year and beyond. A full package of instructional support materials — including an Instructor’s Annotated Edition, an Instructor’s Manual, PowerPoint slides, videos, and a Test Bank — provides new and experienced instructors all the tools they will need to engage students in this course and increase student retention. 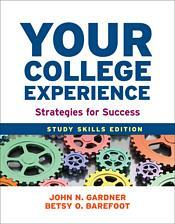 "This text offers more than my current book, specifically, why the student has enrolled in college. As a community college instructor, this question is so important because it is a question that many community college students have not given serious consideration."